I have to say that I am totally thrilled by the submissions that we are receiving for the opportunity to have a stall alongside Craft Guerrilla at the Knitting & Stitching Shows in London, Harrogate and Dublin. The standard and variety of work that we have received is amazing! The Knitting and Stitching Shows are the definitive and best exhibitions for lovers of textiles in the UK and Ireland. As the name suggests, it covers knitting and stitching but SO much more; felt-making, shibori dyeing, jewellery-making, card-making, mixed media... the list goes on! Click here to go to their website and read an overview about the show and feel free to email any questions you have about the opportunity to craftguerrilla@googlemail.com or you can contact us through our Facebook page. Thank you again to all those of you who have sent us your submissions so far. We can't reply to every individual submission that we receive but we will be in touch with those of you who have made it through to the second round by the end of March. Also please pass the opportunity onto your friends and fellow crafty colleagues as we want to spread the word far and wide! Until then, good luck and keep it crafty! That's right...we're 2 years old! 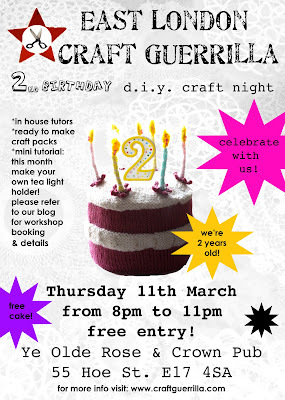 Join us at the usual venue, Ye Olde rose & Crown for a very special diy craft night. Apart from the usual craft making goodies or as we call them Craft Packs- we have the return of the TOMBOLA, cake (oh yes! You know we love cake!) and a special mini work shop courtesy of our lovely friend Katrin. She'll be showing you how to make your own decorative candle holders...tea lights are great but this gal can make them look PRETTY GORGEOUS! *there is a £5 fee per space as it covers work shop, materials and tutor fees. Get crafty with an urban twist at this craft club for adults. Learn to weave, have fun and make felt with adults of all craft friendly abilities. or call Project Leader Megan Dowsett on 07906 651185. An exciting opportunity has arisen for six individual designer makers to exhibit with Craft Guerrilla at the Knitting and Stitching Show in London, Harrogate and Dublin in 2010. Despite the name, the Knitting and Stitching Show exhibits all textiles disciplines so don't feel excluded if you're not a "knitter" or a "stitcher"! Six different designer makers will be selected to take part for each of the shows in London, Harrogate and Dublin, making eighteen places offered in total. Please be sure to indicate the nearest show to your hometown in your submission. If you would like to apply for this opportunity then please send us up to five photos of your work by 11th March 2010 together with 200 words telling us why you should have a stall at the Knitting and Stitching Show, paying attention to the three criteria detailed below. There will be interviews and requests for samples of work for those who are successful in the first round and a decision will be made by end May 2010. Please send the photos as .jpg files no larger than 1MB each together with your 200 words, your contact details and the location of your nearest Knitting and Stitching Show (London, Harrogate or Dublin) to craftguerrilla@googlemail.com. The opportunity for a free stall at the Knitting and Stitching Show is for designer makers who have not yet managed to translate their talent and enthusiasm into much more than a hobby. If having a space at such a large event would enable you to take the next step into the craft business world then this may be your chance. Artistic merit that broadens and compliments that of the Craft Guerrilla collective. The Craft Guerrilla collective is made up of a variety of designer makers. We particularly celebrate work that is unusual, high quality, hand made and above all has soul. We will be looking for designer makers who we feel would compliment this with their work and would stand out from the crowd at the rest of the show. Craft Guerrilla is offering the stalls at the Knitting and Stitching show to provide new blood and open up the show to a new audience. We do not want to simply replicate other stalls in the exhibition. Demonstration of support of the Craft Guerrilla manifesto. Whilst not having to be a member of Craft Guerrilla we feel it is important that applicants support our Manifesto and don’t contradict it in their work. A copy of our manifesto is provided below. The ability of a stall at The Knitting and Stitching show to have a profound impact on the craft business of the applicant. If you already have a successful craft business this probably isn’t for you. If you wouldn’t be able to build on the success of the show then this may not be for you either. We are looking for people who need such exposure to enable them to take the plunge into building up a craft business. The Craft Guerrilla is a group set up to work with independent Crafts People, Artists and Designers Makers of quality hand made goods. The aim of The Craft Guerrilla is to join forces with other creative individuals and set up craft events in vacant or unused venues, associate with "friendly" businesses, provide a community to link and cross promote independent designer makers, sister armies in other cities, share web traffic, and provide helpful information to other designer maker groups as well as individual designer makers. "Our main aim is to work within a creative community, thrive and grow as a collective that benefits each and every person involved, share our creative know how, our experience and the ethos and value of hand made goods!" The Craft Guerrilla Army is taking on the world for a better hand made existence! We've had enough of soulless, mass produced tat and so has the average consumer. The Craft Guerrilla was born out of a shared idealism with regeneration, recycling, sharing of knowledge and the revaluation of the handmade movement at its heart. "We want to show people the true meaning and value of quality hand crafted designer goods through our ethos and principals of co-operation, collaboration and experience gained by working within a creative community." We’re all for learning and that is why we set up our highly successful DIY craft nights and crafternoons. We have also started providing mini-workshops for the public at our DIY Craft Nights - "classes for the masses"- one off, short courses at affordable prices held by professional designer makers. We're a peaceful bunch but we're looking to create opportunities, we're ready to take action, take over and DIY our own opportunities. Download the flyer to pass onto your friends! An overwhelming urge to learn crochet has come over our lovely crafters and unfortunately this month there are no more spaces left! BUT don't get your yarn in a tangle as you can get on the waiting list! Because of so much interest we're now looking into finding a suitable venue to do a one day crochet workshop. Hooray summer is well and truly on our minds...OK it's a while away but because we're so looking forward to another season of Craft Markets we're releasing the dates now. This way there's no chance of double booking yourselves! Please note that bookings are not open yet. We'll start taking them on Monday March the 22nd. 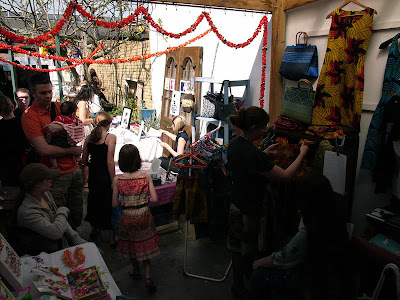 Craft Markets are on from 10 am to 5pm.